We have been diligently working on writing persuasively and formulating good thesis statements and paragraphs. Students have participated in activities that have forced them to form and support opinions on topics such as animal testing, self driving cars, and the death penalty. We continue to examine grammar rules and add to our word wall each week. Students in Mrs. Dyson's Language Arts are reading Jeremy Fink and the Meaning of Life. Students have been creating their own test questions in Google Classroom, which have been used for their quizzes. We've spent time blogging about different chapters using persuasive writing to convince our peers why our point or opinions about the various chapters is valid. Mrs. Kerr's Language Arts class has continued exploring the theme of courage while reading poems with brave characters, including "Wreck of the Hesperus", "Casabianca", and "Friends in the Klan". Next, students will debate factory farming issues, reading nonfiction articles for background information. Only a quarter and a half left for the 40 Book Challenge...keep reading! Mr. Hockaday's classes are learning ALGEBRA! You read that right....ALGEBRA! We are discovering the basics in algebra including variables, exponents, terms, numerical expressions, algebraic expressions, simplifying expressions, and substituting in expressions. Students are working hard every day using our four properties to help us simplify and solve. Do ya like Jazz?? Your child may have to explain that one! We are surrounded by pollinators and they are springing into action. Plants and flowers have been a great topic of discussion. We have dissected beans, planted our own zinnias and marigolds, and we even have a homemade green house in our classroom! These should be ready to bring home in a few weeks and will bloom all spring and summer! Mr. Strickland's Science class has investigated plant reproduction and plant structure through various online activities like The Great Plant Escape. We were asked to solve mysteries by reading a case brief and collecting evidence. Only through evaluating our facts and comparing our data were we able to crack the case. We also took part in a two day dissection lab where we analyzed parts of seeds and watched them begin their germination process. Greek Polis comes alive! Students have been participating in an Ancient Greek simulation where students had to design and name a Greek city-state, participate in the Persian Wars, create and use a structured government, and participate in the Olympic games. We will conclude our studies by analyzing the accomplishments of Alexander the Great before moving on to the study of Ancient China. Mrs. Smith's Social Studies classes have completed our study of Ancient India. Students have learned about the way of life in India and the 2 most important religions in India, Hinduism and Buddhism. We have also learned about important people namely Mohandas Gandhi and The Buddha and how they influenced the people during their lives. Students have enjoyed learning about the social divisions, the caste system, and how it is still practiced in India today. Some students really did not enjoy our caste system simulation, especially if they were a member of the untouchables! Now we are deep into the study of Ancient China and during our time studying China we will get in touch with our artistic side by creating our own terra cotta soldiers like the ones found in the Emperor's tomb!! North Davie Middle School collects "Boxtops for Education" to help fund our pincentive program. The pincentive program is a great way to remember your child's time here at NDMS. 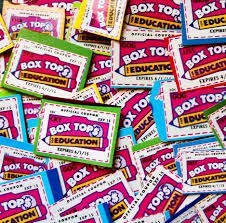 Students should turn their boxtops into their homeroom teacher. Please consider turning these in at your convenience. For more information on Boxtops or our pincentive program, please contact the front office.